This is a "WAW" wait-a-while shipping order. This unit will be shipped within 1-3 months. 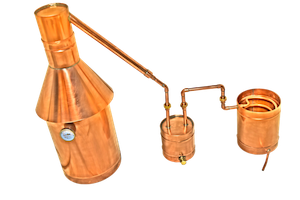 We specialize in the manufacturing and production of these 20 gallon all copper MOONSHINE STILLS which are handcrafted to perfection. Made using heavy gauge copper and lead free solder, our units are built to last. All of our units are water tested and have ZERO leaks. What you are looking at here is a 20 gallon COPPER MOONSHINE STILL. Hand-crafted in the State of New Hampshire! This still is GUARANTEED to last.